Here is a photograph taken on Wednesday of our London Show Dusplay from the balcony above. The plants are now all safely back at school and happy after a good soaking with rain water. i am really proud of the student and adult team that put together our most successful London Show ever. 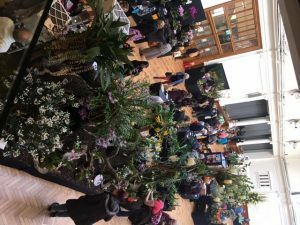 I have had hundreds of people asking me to pass on congratulations to the amazing orchid project students, both those who worked so hard at the show and those who worked so hard at school to grow such great plants and prepare for the show. Our next event is the Devon Orchid Show in Budleigh Salterton on May the 4th (Star Wars Day) we hope to see you their.